Trainer Rex Lipp has been thrilled with the benefit Tinto has taken from a brief freshen-up and is confident his stable star will return a real chance of success in Saturday’s Group 2 Guy Walter Stakes (1400m) at Royal Randwick. 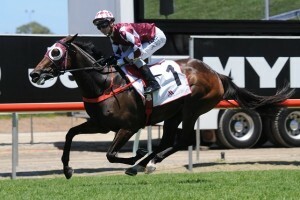 A Group 1 winner having taken out the 2014 edition of the Queensland Oaks (2400m), Tinto has been a strong and consistent performer for Lipp since debuting to racing in 2013; posting an impressive seven wins a five minors through only 24 starts. Having returned to the paddock after successfully defending her crown with a dominant display in the Magic Millions Trophy (1800m) on the Gold Coast on January 9th, Lipp told Sky Racing HQ he is confident the 2016 Guy Walter Stakes figures as an ideal launch pad for the Red Dazzler mare leading into autumn. “We went through the Winter Carnival calendar and there were really only one or two races that stood out for her,” Lipp said. “One of them was the Doomben Cup and in all the starts she has had at Doomben she has never won at Doomben and Doomben is just not her track. “She only had a week off, but in saying that she did a lot of swimming and walking, which freshened her right up. “She is a great doer, when she came home the night after the Magic Millions Stayers Cup she ate her feed and more or less said the next morning where do we go now. “She came through the jump out very nicely, in the jump out she did what I wanted her to do, she just sprinted through the line very strong. Lipp confirmed the Group 1 Coolmore Classic (1500m) in a fortnight will figure as Tinto’s return to Group 1 company before likely progression to a target during The Championships. “We will go to the Coolmore and then we will decide whether we go to the Doncaster or the Queen Elizabeth or we did throw her in the Queen Of The Turf over the mile,” Lipp said. “Randwick is her track and I am desperate to try and win the Coolmore. Requiring a couple of runs to find form upon resuming this time, Tinto charged home to finish second behind Happy Clapper in the Group 2 Villiers Stakes (1600m) at Randwick on December 12th; progressing to success in the Origin Jockeys Series Heat (1800m) in her only other start prior to the Magic Millions Trophy on Boxing Day. Ladbrokes.com.au is currently offering Tinto at 2016 Guy Walter Stakes odds of $10 for success.